WILLIAM EDWARD DODD was born in Clayton, NC in 1869 and received a B.S. in 1895 and a M.S. in 1897 from Virginia Polytechnic Institute and a PhD in 1900 from the University of Leipzig. He was a distinguished educator, author and historian of the American South. He taught at Randolph Macon College and later at the University of Chicago. 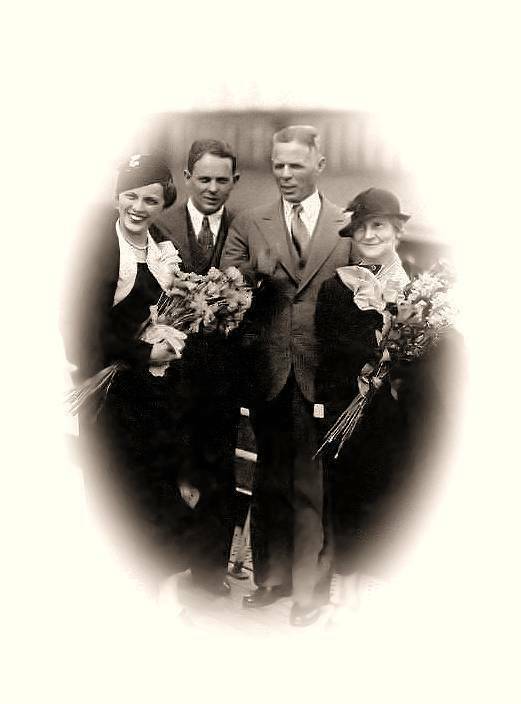 Dr. Dodd served as Ambassador to Germany from 1933-1937. He married Martha Ida "Mattie" Johns in 1901. The Dodds had two children: William E. Dodd, Jr. and Martha Eccles Dodd. Washington, June 10- President Roosevelt today nominated William E. Dodd, a native of North Carolina who has been professor of American history at the University of Chicago since 1908 as Ambassador to Germany. Chicago, June 10- Prof. William E. Dodd, nominated by President Roosevelt today as Ambassador to Germany, is an authority on American history who finished his education in Germany and purchased a Virginia farm for a source of recreation. Since 1908 he has been a professor of American history at the University of Chicago. He was an intimate friend of Woodrow Wilson, having written a biography and edited the public papers of the war-time President and has been a counselor in Democratic political champaigns for years. Next year he will become president of the American Historical Society, one of the highest honors to a historian. He will be advance automatically from first vice-president. Dodd was born October 21, 1869 at Clayton, NC. His wife, before marriage was Mattie Johns. She was born at Auburn, NC. They have two children, William E. Dodd, a historian now employed in the Congressional Library at Washington and Martha, assistant literary editor of the Chicago Tribune. Obtaining his PhD at the University of Leipzig in 1900, Dodd came to the University of Chicago after eight years as professor at Randolph-Macon College, Ashland, VA. Spare but tanned and ruddy from three months spent every year on his farm, Stoneleigh, near Round Hill, VA, with courtly manner and soft Southern voice, he is regarded as one of the best lecturers at the University of Chicago. Dodd was suffering today from hay fever in his home in Hyde Park, residential district near the University. He said he would accept the appointment if Mr. Roosevelt's nomination were ratified by the Senate. Robert Maynard Hutchins, president of the University, said he believed Professor Dodd was "peculiarly fitted to the post." Clayton, June 10- Much interest was felt here in the appointment of Dr. W. E. Dodd as Ambassador to Germany. He was born here Oct. 21, 1869, the son of John D. and Evelyn Creech Dodd. He had made frequent trips back to his home state and on a recent occasion was the chief speaker at a meeting of the North Carolina Literary and Historical Association. He is a cousin of Charles W. Horne, Miss Melba McCullers and other well known people in Johnston County. He is also a cousin of Dr. Herman Harrell Horne, eminent member of the faculty of the University of the City of New York. DR. WILLIAM E. DODD, a Johnston County farm boy, who became one of the nation's leading authorities on American history and then United States Ambassador to Germany, died Friday afternoon at his Virginia estate, Stoneleigh Farm, near Round Hill. Bitter opposition to the Nazi regime led Dr. Dodd to resign his post in Berlin two years ago and return to this country where he launched a speaking tour criticizing the Hitler government. He suffered a partial physical breakdown and in recent months had been spending most of his time at his estate. Seventy years old, Dr. Dodd was further weakened by an attack of pneumonia, which was the immediate cause of his death. He was placed in an oxygen tent Thursday but death came at 3:10 P.M. the following day. The funeral rites were conducted Sunday at noon at the home and burial followed in the family burying ground on the estate. Dr. Dodd is survived by a son William E. Dodd, Jr. of Stoneleigh Farm and a daughter, Mrs. Alfred Stern of New York. Surviving also are two brothers, Rev. E. D. Dodd of Norlina, former Methodist pastor on the Four Oaks charge and Rev. W. H. Dodd of Mocksville, and a sister, Mrs. Annie Dodd Griffin, who also lives in North Carolina. Dr. Dodd was born near Clayton October 21, 1869, a son of John D. and Evelyn Creech Dodd. He attended the schools of Johnston and Wake Counties and Oak Ridge Institute and was graduated from Virginia Polytechnic Institute in 1895 with the Bachelor of Science degree. Two years late he received his Master's degree from V.P.I. Leaving V.P.I., he attended the University of Leipzig in Germany for three years and won his Ph.D. degree in 1900. For eight years Dr. Dodd was a member of the history faculty of Randolph-Macon College and in 1908 he joined the history department of Chicago University where he served a quarter of century, resigning in 1933 when President Roosevelt appointed him to become Ambassador to Germany. Cordially received by President Paul Von Hindenburg as one having "warm appreciation of the cultural bonds between the two countries," Dr. Dodd left the diplomatic post in January 1938, a bitter foe of Nazism, with no word of farewell from Berlin officialdom. He quit the country more unceremoniously than any other American envoy. He had, meanwhile, lost face in Washington by intervening in the 1937 Congressional fight against reorganization of the Unites States Supreme Court. Writing from Berlin in April to several Senators, he warned them of a "dictatorship plot in the United States, backed by an American billionaire," refused to reveal the source of his information or to name the "billionaire," and brought down on himself the denunciation of the late Senator William E. Borah. The following September, while Dr. Dodd was on vacation in America, he protested to the State Department over the acceptance by his charge d'affaires, Prentiss Gilbert, of an invitation to attend the Nazi Party congress at Nurnberg. Cordell Hull, Secretary of State, overruled Dr. Dodd's objections. The latter soon after resuming his post in November, sent in his resignation. Relieved of his diplomatic status, Dr. Dodd bitterly assailed the government to which he had been accredited. He wrote and spoke to audience in Canada and the East attacking the Nazi regime. Before going to Germany in 1933, Dr. Dodd lived a quiet life as a historian. On December 24, 1900, he had married Martha Johns of Auburn in Wake County. He wrote a number of books which stamped him as an authority on American history and particularly history of the South. Among his best known work are "Life of Jefferson Davis," "Statesman of the Old South," and "Woodrow Wilson and His Work." With Ray Stannard Baker, he edited "Public Paper of Woodrow Wilson." During the last twenty years of his life, Dr. Dodd's visits to his old home in North Carolina were infrequent. Recently his 92-year old father, John Dodd of Fuquay Springs, said of his distinguished son's visits home: "Will never stays long. He's like a humming bird, in and out like a flash. Will always stays busy. I guess he has done more than any other man alive." Dr. Dodd's passing brought many messages of sympathy to the family from high officials of the Federal government, including Secretary of State Hull.